It's time for a new challenge over at the Mixed Media Monthly Challenge. 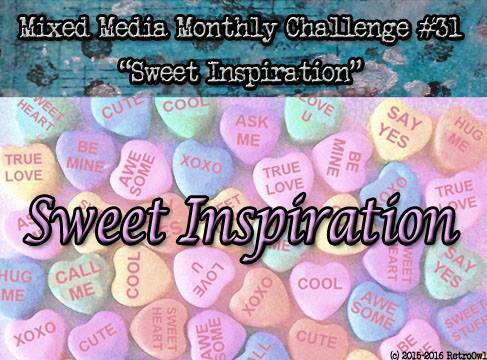 Our theme is "Sweet Inspiration." Just take inspiration from our challenge graphic. Our sponsor this month is the awesome stamp company Stampendous. They are offering our random monthly winner a $25 gift certificate. They were very generous to send our design team members, stamps, modeling paste and their Dreamweaver stencils!! I made a card using stamps from one of the new Pink Your Life stamp sets, and a Mason Jar stamp and die set, and a Make It Pop cutting set. On the front of the card, I stamped flowers and butterflies in Versamark Ink and brushed pink Perfect Pearls over it to make a subtle background. I used the label and oval dies from the Make it Pop die set and HELLO from a Pink Your Life stamp set. I inked the edges of everything with a Teal ink from Prima. On the inside of the card, I used one of the Pop Up dies to make the flowers and mason jar stand up when you open the card. I had made a card that didn't work using lots of ink sprays, a Dreamweaver stencil with and Pearlized modeling paste. I decided to use some of the other dies in the die set to cut up the background of my card and added it to the middle of the inside of the card. Finally, with an ink blender brush, I added Distress ink in Shaded Lilac to the white card stock I used to line the inside of the card. The lavender card stock I used for the card is from Stampin' Up. I colored the flowers and mason jar with Prisma colored pencils. I also added some glitter pens to the flowers and sentiment on the front of the card. A wonderful project - Love this special card! What a special card! Such an unexpected surprise for the recipient. Lovely Creation !! adore the colors !! 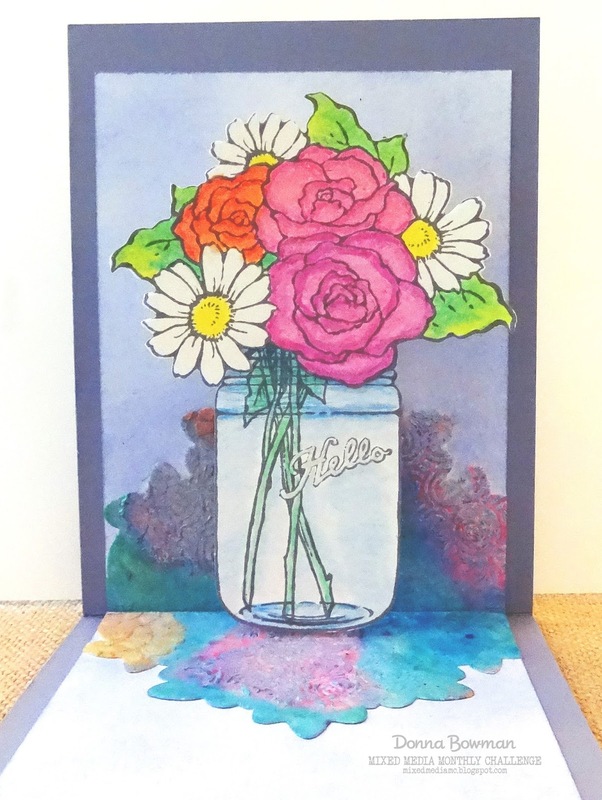 Such a pretty card - love the watercolors! Wow! Fabulous pop up card and love the flowers!! Beautifully done!